St Peter was venerated as a universal saint from early Christian times. According to the gospel, Christ proclaimed Peter as the rock on which the Church would be built and gave him the keys to the Kingdom of Heaven. He is shown here as the heavenly gatekeeper. The panel is divided horizontally by a battlemented ledge above which are the top parts of three figures. God the Father is in the centre, haloed, crowned and bearded, with his hands raised in blessing and wearing a gown and a cloak. He is flanked by two winged angels wearing albs and amices who look down at him, the one on the left-hand side playing a harp and the one on the right a lute. St. Peter, who wears a bifid beard, stands on the left-hand side of the lower part of the panel, a symbolic key tucked under his right arm and a scroll rising from his raised right hand. He wears a gown with a cloak over his shoulders. With his left hand he either accepts from a naked figure representing a soul, a fruit-like object, or alternatively he offers it to the soul. The winged figure of St. Michael wearing a tiara, alb and amice stands, his right hand raised, on the right-hand side of the panel behind three naked figures representing souls which he introduces to St. Peter. They walk up steps, left leg leading, across the panel looking up at the saint, their hands held together in front of them in prayer. The leading soul raises his right hand and holds the stalked fruit-like object with the left. The back of a fourth soul is seen entering the gate of heaven, which is cut through the panel. The left leg of the leading soul is damaged below the knee. The left legs of the two other standing figures of souls are missing. There is a hole in St. Michael's right wing. The edges of the upper section of the panel have been slighly damaged. Green paint and the usual daisy pattern remain on the ground. Traces of red flecked with white and black decorate the wings of St. Michael and the angels. The upper ground is gilded and has the remains of gesso knobs. Other details are picked out in gilt, especially the hair and beard of God the Father and the angels' musical instruments. The back of the panel is incised with four lines. There are three lead-plugged holes, two with latten wires attached. The bottom has been cut away. Acquired by Dr W. L. Hildburgh in London. Bought by vendor in Amsterdam in 1930. On loan from Dr Hildburgh since 1930. Given by Dr Hildburgh in 1946. 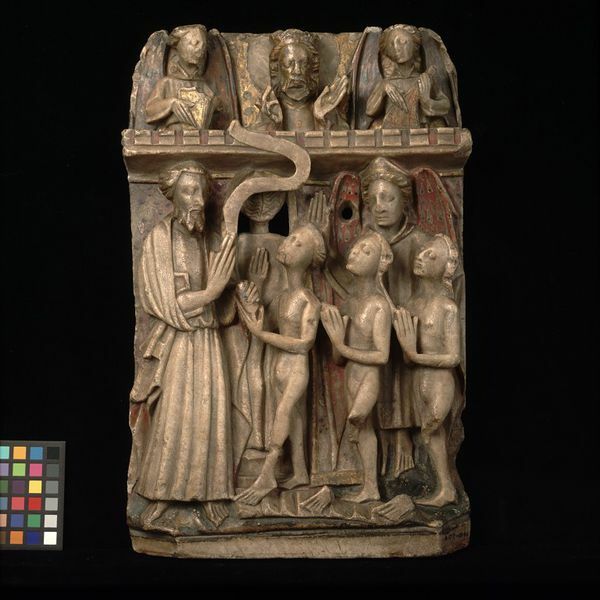 Alabaster panel depicting St Peter receiving the souls of the blessed into Heaven. English, 15th century.